I am terrified. I discovered my front tooth is loose. I don’t remember hitting it and I don’t think the other teeth are loose. Can a dentist fix this? What if it can’t be fixed? Do they make dentures for one tooth? Help me! First, I want you to take a deep breath. You will not end up with a space where a front tooth should be for the rest of your life. The first thing you need to do is schedule an emergency appointment with your dentist. If the tooth is loose, regardless of the cause, it needs to be splinted to keep it secure. Next, your dentist will need to determine why it’s loose. Do you have gum disease? Was there trauma? He’ll want to do some x-rays to see if the pulp was damaged. If so, you’ll need a root canal treatment. If you do end up losing this tooth, which would surprise me if this is the first sign of a problem and you don’t remember any trauma, there are solutions. We’ll go over each of them, from the least desirable (and least expensive) to the highest quality replacement, which is also more pricey. Yes, there are “dentures” for a single tooth. It’s called a removable partial denture. It connects onto your other, healthy teeth, with a false tooth attached. 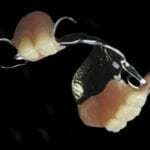 It does put pressure on the teeth it hooks to so it’s not the ideal solution, but depending on your budget, you might use it as a temporary solution while you save up for one of the more preferable treatments. The next best solution is a dental bridge. This suspends a false tooth between two dental crowns. In reality, this makes more sense if your adjacent teeth (which will receive the crowns) need work anyway. In that case, it’s like knocking out two problems with one. However, if they don’t need work, I wouldn’t want to remove any healthy tooth structure. 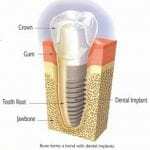 The top of the line replacement is to get a dental implant. It’s like having a healthy, natural tooth back. If your budget allows, this would be the treatment I’d choose. A prosthetic root is implanted where the natural root was, then a porcelain crown is placed on top. You can eat, brush, and floss just like you normally would. They’re very strong and last for many years. You’re talking about replacing a front tooth, so you want to be certain the dentist is also a skilled cosmetic dentist. Whatever crown he creates for your front tooth needs to look just like the adjacent tooth. Above all else, make sure they give you an all-porcelain crown and not a porcelain-fused-to-metal crown. Could CEREC Crown Have Saved My Tooth? I needed a root canal treatment and dental crown. 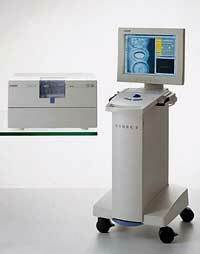 I wanted to do a CEREC crown, but my dentist doesn’t have the machine. I considered going elsewhere, but felt guilty about going to another dentist. So, I thought the traditional crown would have to suffice. After he made the temporary, I had to go out of town for work. While I was gone, the temporary crown broke. I called my dentist and he said it would be fine, though to try and eat on the other side of my mouth. I was super careful. When I got back, I immediately went to the dentist but he told me that a crown would no longer work. First, the crown would no longer fit and we’d have to start over. But, that part of my tooth broke and the rest was brittle, so he’d have to do an extraction. Is this really my only option? Now what? I’m over $2000 into this crown which I can’t even have and now I’m losing the tooth. Should I have gone to a CEREC dentist? There are some things that bother me about what you’re saying. I’d like you to get a second opinion to see if your tooth can be saved. Preferably to a dentist who does provide CEREC crowns. Some dentists will even do free second opinions. While certainly, a CEREC crown would have saved your tooth, because it would have been protected from day one, there’s more at issue here. If he’d have suggested you see an emergency dentist when your temporary broke, this would also have protected your tooth. It would also have allowed your permanent crown to fit. When you leave the space empty, it doesn’t always take very long for your teeth to shift leading to the crown not fitting properly. This was your dentist’s fault. Something else which bothers me is how quickly the tooth became brittle. That’s uncommon. If You Can’t Get a CEREC Crown and Lose the Tooth, What then? If it turns out you can’t save the tooth, I’d first ask for a full refund from your first dentist. Then it’s time to decide on a tooth replacement. The two best options are dental implants or a dental bridge. A dental bridge would make more sense if either of the adjacent teeth need to be crowned. If they don’t, then a dental implant would be a better option. It’s a great tooth replacement, but you don’t want just any dentist to do it. It’s an advanced procedure. Be sure to ask the dentist how many they’ve done and what their success rate is? It needs to be at least 98%. Can a General Dentist do Dental Implants? I need to replace a tooth. Everyone says dental implants are the best replacement. Are there implant specialists or can a general dentist do them? First, I’ll say, yes, dental implants really are the top of the line tooth replacement. Be aware that not everyone is a candidate for dental implants. There are some conditions which are contra-indicative, like gum disease. Or, if you’re a smoker, you’ll be hard-pressed to find a good dentist willing to go forward with the procedure. If it turns out you’re not a candidate, there are other good options which we’ll discuss momentarily. As to whether or not you need a dental implant specialist, that’s a yes and no. There isn’t actually a recognized specialty in implants, so any dentist who does them is a general dentist. However, it takes some additional training than what they get in dental school to be skilled in this procedure. So, what if you’re not a good candidate? Whatever dentist you go to should give you all your options. For instance, the next best procedure would likely be a dental bridge. 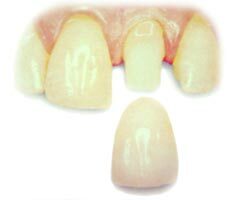 In fact, if your adjacent teeth need a crown, a dental bridge might make more sense for you. The important thing is you find a dentist you trust and then have them explain all the procedures you’re a candidate for. I have two teeth that need work. They’re right next to each other. One needs a crown. The other needs to be extracted. I want to do a dental implant and a crown. My dentist wants to do a bridge. I’d think he’d be more excited about a dental implant because they’re more expensive, but he seems pretty insistent about a bridge. Is there a real medical reason for this? I’m not too excited about the idea of a bridge. My guess is your dentist isn’t comfortable with dental implants. It’s an extremely advanced procedure. I wouldn’t push your dentist if that’s the case. When it’s not done perfectly, there can be serious complications. It’s a credit to your dentist that he’s not just taking your money and doing the procedure halfway. A bridge is fine in your case. You already need work on one of the adjacent teeth, so it’s like getting two procedures knocked out in one—no pun intended. However, your other tooth is healthy so you might not want to grind down healthy tooth structure. I understand your desire to go with an implant and crown. My suggestion would be to get the implant and crown, but with another dentist. I’m not saying leave your current dentist, just have this particular procedure done with someone else. Then, you can continue with your current dentist for general treatments and cleanings afterward. What are some decent tooth replacement options? I have to get a tooth extracted. I wanted to get a second opinion on some good tooth replacement options. Money is no object. I want the best. What are your thoughts? My initial thought is if you want the top tooth replacement option, than just about any dentist would tell you to get dental implants. They’re the most like having your own natural tooth. If you’re in good general health, than you are likely a candidate. There are times when a dental bridge makes more sense. That’s generally if the adjacent teeth to the missing tooth happen to need dental crowns. If that’s the case, a dental bridge will take care of two procedures at once. You didn’t say what your dentist suggested. If he’s not adequately trained in dental implants, then he wouldn’t be likely to suggest them. But, it is the ideal treatment if you’re a candidate. There are other options, as well, aside from implants and bridges, such as a removable partial denture, but you asked for the top treatments. Trying to decide between a dental implant or a bridge? I have a tooth I need to replace. I am trying to decide whether I should get a dental implant or a bridge. Is there any advantage to the implant? They are much more expensive. This is an important question. 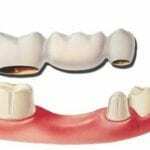 Dental implants are fantastic and function much more like your natural teeth than a bridge, but there are times where a bridge would make more sense. Your dentist can help you determine which one is the better treatment, but here is a basic guideline. When one of your adjacent teeth needs some work, such as a dental crown. If you’re going to need to have an adjacent tooth ground down anyway, you can save money by getting a bridge. It will replace your tooth and crown the sick one simultaneously. If, on the other hand, both of the adjacent teeth are healthy and you have the money, you’ll be much happier with the dental implant. It is much more like your natural tooth. This blog is brought to you by Louisiana Cosmetic Dentist Dr.Mike Malone. I had four teeth removed because of gum disease. My dentist is planning on giving me a dental bridge to replace the teeth, but my other teeth are starting to get loose. Should I go through with this procedure? I am quite concerned about this treatment. If you’ve lost teeth because of gum disease, that has to be treated before you try to put any permanent replacement on. A dental bridge needs anchor teeth, which will put pressure on them. They’re already coming loose. The bridge will pull them right out. Your dentist has a disaster planned for you. What you need right now if to start treatments for periodontal disease. Your loose teeth will need be stabilized while that is taking place.